December 10th is fast approaching… that is the date of the University Carol Service. 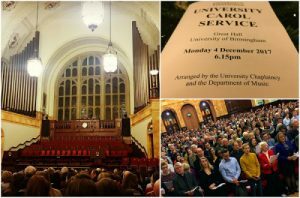 The Carol Service is one of the biggest events in the university year. We expect around 1,000 people to fit into the Great Hall. An important part of making this happen is the stewards. We need 32 kind people to volunteer to be a steward on the night. The stewards will need to be free to come to a short rehearsal at 4.45pm in the Great Hall and to be ready for the doors to open at 5.30pm. Usually, for the smartly dressed stewards there is a possibility to attend the Chaplaincy Dinner which follows the Carol Service. We will know how many places we have on the night. If interested in helping out contact Sr Una on u.coogan@nham.ac.uk.